by aviesplace2012 in Christian Devotionals, Christianity, Faith, Religion, Spiritual Warfare, Uncategorized Tags: Are you "in Christ Jesus"?, Christ Jesus, Do you fear Judgment Day?, God, God - Father, Have you been told you must "turn or burn"?, Holy Spirit, Lord Jesus Christ, What does repentance really mean? Acts 17:28 in the NKJV says: “for in Him we live and move and have our being,”. For me as a born again Christian that means that I am “in Christ Jesus”, my life is not my own and all things that I encounter in this life revolve around my relationship with the Lord Jesus Christ. I am not my own, but I have been bought with a price; the blood of Jesus Christ. I am His and He is mine! Hallelujah! I often think about life before being “in Him”. It was one of uncertainty, wondering if I would be “good enough” to enter heaven when I died. I was raised in a denominational church that believed that your works would be what would give you entrance into heaven, but you didn’t know if you had been “good enough” until you got there and then it would be too late to do anything about it if you hadn’t. It was a “maybe you are” and “maybe you aren’t” “good enough” type of situation. I didn’t know from one day to the next whether I would “make it” or not. Acts 17:31 tells me that there is coming a day when God will judge the world to see which ones are “in Christ Jesus” and which aren’t. The key is in repenting and giving your heart to Him today so you will be ready for that Day of Judgment. To “repent” is the Greek word “metanoeo” and it means “to change one’s mind or purpose”; to “turn around” from the direction you are going to go another direction. This portion of Scripture says that all men have been made by God for the purpose of seeking Him. As we look into the world today we see a people who are self-centered, focused on one thing only, and that is themselves and what will satisfy their heart’s desires. This people, who the Word says have all been made in the likeness and image of God, are seeking satisfaction and fulfillment in everything but Him. The word says that they have been in “times of ignorance” and He declares that they all should repent before the “fixed” day of judgment comes. I don’t often teach on repentance or that there is coming a day of judgment because I don’t believe in portraying my God as a “turn or burn” type of God. He is a loving heavenly Father that has created man in His own image so He can fill or “inhabit” His creation to lead, guide and bless them with His presence. My God leads men to repentance through His goodness. Romans 2:4 Or do you despise the riches of His goodness, forbearance, and longsuffering, no knowing that the goodness of God leads you to repentance? My mother always said that more flies are drawn to honey than to vinegar. I believe people are drawn to God through seeing His goodness and understanding that He loves them and wants a living and vital relationship with them more than in seeing Him as a God of judgment. But, as the Word says, there is coming a day when He will look at the record books in heaven and determine which ones, by their own choice, have accepted Jesus as Savior and Lord, thus deserving an eternity with Him in heaven. That is the Day of Judgment. It is simply to determine who spends eternity with Him or separated from Him. Repentance brings “times of refreshing”. 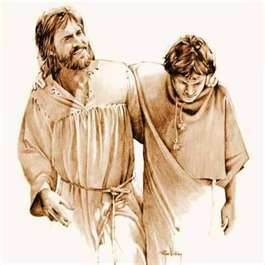 Many believe that when we instruct people to “turn around” from the way they are going to following Christ Jesus that they will have to give up the good life for a life of dutiful, mundane living. But the Word says that “times of refreshing” will come from the Lord when we repent. The “good life” awaits you when you turn to the Lord. It’s not a life of no problems, but you have the Lord of Life living within you to direct you through the storms of life and give you peace in the midst of them. A life of victory awaits you when you to turn to the Lord. You don’t life beneath your circumstances, but He equips you to live “above”; to be victorious and more than a conqueror because of His presence within you. Romans 8:31, 32 NKJV What then shall we say to these things? If God is for us, who can be against us? He who did not spare His own Son, but delivered Him up for us all, how shall He not with Him also freely give us all things? God gave Jesus for us….His life for ours! God is not holding that against us, but He did that so that He could freely give us salvation and all things! He is a loving heavenly Father, ready to provide for our every need that we might understand His goodness. God wants you to be His so that He can pour out His love upon you and fill you with His fullness. He wants to strengthen you through His Spirit in your inner man, to equip you and give you an understanding of His love. God doesn’t love you because He loves; He loves you because He is love. His very nature is love. He can’t do anything but love His people. 1 John 4:7-10 Beloved, let us love one another, for love is of God; and everyone who loves is born of God and knows God. He who does not love does not know God, for God is love. In this the love of God was manifested toward us, that God has sent His only begotten Son into the world, that we might live through Him. In this is love, not that we loved God, but that He loved us and sent His Son to be the propitiation for our sins. God loved us so much that He gave His son to be the propitiation, or payment for our sin. This payment satisfied the wrath of God that was there because of sin. It paid the price to establish man “in Him”, to place man “in Christ Jesus”. I woke up this morning with this song on my heart. It says about God: “You are the love of my life; You are the hope that I cling to; You mean more than this world to me. I’d rather have You than silver or gold. I’d rather have You than riches untold. You are; You are my everything”. I can sing that because it’s “in Him” that I live and move and have my being. I want to invite you today to make Him yours and to give your heart to Him that you may also live “in Him”. Won’t you accept Jesus into your heart to be your own personal Lord and Savior today? Make this your day of salvation! Pray and ask Him to come into your heart; to save you and live each day with you. Pray this prayer and mean it sincerely in your heart. Father, I come before You confessing that I am a sinner, both by birth and by choice. I have lived my life for myself but I now realize that I need to repent, to change my mind and turn around and live for You. I ask You to forgive me of my sin, to save me and come and live in my heart to be my own personal Lord and Savior. I receive the gift of salvation that You have so freely given for me in the crucifixion and resurrection of Your Son, Jesus Christ. I believe that if I were the only person on the face of the earth You would have still given Jesus to pay the price for my sin. I receive Him into my heart and I thank You for saving me. I vow to live every day for You from this moment on. In Jesus’ name I pray. Amen. If you prayed that prayer for the first time and really meant it, you are now “in Christ Jesus”. You are “in Him” and are a part of the family of God. Congratulations! That is the most important decision you will ever make in your whole life. Your eternity is now sealed with God and will be spent in heaven with Him. Father, I pray for those who have prayed to receive Jesus into their hearts this morning. I ask that You would make Your presence real to them that they might grow in their relationship with You. Thank You for saving them, for paying the price that they might be set free from sin, death and Hell. Thank You for bringing them into Your family this morning. Father, I pray for my friends who may be going through difficulties today. I ask that You would make Your presence known to them as well. That You would strengthen them in their inner man by Your Spirit who lives within them that they might be assured of Your love for them. I pray that they will look to You for the answers to life’s problems for it is in You that they live and move and have their being. You are the answer, Lord Jesus! May they find comfort in knowing that You have made them more than a conqueror through Your love for them. Thank You for granting them the victory in You! In Jesus’ name I pray. Amen. by aviesplace2012 in Christian Devotionals, Christianity, Faith, Religion, Spiritual Warfare, Uncategorized Tags: Are you walking by faith?, Christ Jesus, Deity, God, God the Father, Have you received Christ Jesus?, HolySpirit, If you are in Christ Jesus you are complete in Him. Colossians 2:6-10 AMP As you have therefore received Christ, [even] Jesus the Lord, [so] walk (regulate your lives and conduct yourselves) in union with and conformity to Him. Have the roots [of your being] firmly and deeply planted [in Him, fixed and founded in Him], being continually built up in Him, becoming increasingly more confirmed and established in the faith, just as you were taught, and abounding and overflowing in it with thanksgiving. See to it that no one carries you off as spoil or makes you yourselves captive by his so-called philosophy and intellectualism and vain deceit (idle fancies and plain nonsense), following human tradition (men’s ideas of the material rather than the spiritual world), just crude notions following the rudimentary and elemental teachings of the universe and disregarding [the teachings of] Christ ( the Messiah). For in Him the whole fullness of Deity (the Godhead) continues to dwell in bodily form [giving complete expression of the divine nature]. And you are in Him, made full and having come to fullness of life [in Christ you too are filled with the God-head—Father, Son and Holy Spirit—and reach full spiritual stature]. And He is the Head of all rule and authority [of every angelic principality and power]. I love this portion of Scripture. It speaks of who we are in Christ Jesus and the importance of dwelling on His word so that we can walk by faith and not be impressed and swayed by the traditions of men. As you have therefore received Christ…..how did you receive Christ? I received Him into my life by God’s grace, His unmerited, free gift of salvation, appropriated by my faith! I received Christ Jesus by faith and so I am instructed to regulate and conduct my life in the same manner….by faith! So many are out there trying to work to make themselves acceptable to God. But it’s all in vain! There is no salvation apart from receiving the finished work of Jesus Christ on the Cross for the sin of mankind. Have you ever watched a little sapling when it is first planted and how it handles the wind in a storm? While it is a newly planted tree, in the midst of the storm, it bends clear over to where it touches the ground and it seems as if it might not make it through the heat of the storm. But as it’s roots grow down deep into the soil it soon becomes rooted and grounded and much stronger to withstand the effects of the winds and rain of a heavy storm. It is more established in it’s source of strength, which is the soil of the ground around it. 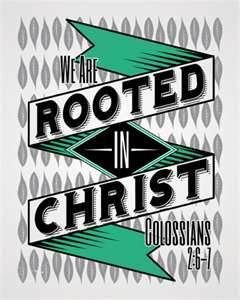 So it is with us when we are firmly rooted and deeply planted in Christ Jesus. We become increasingly strengthened as we are established in the faith! Colossians 2:8 NKJV Beware lest anyone cheat you through philosophy and empty deceit, according to the tradition of men, according to the basic principles of the world, and not according to Christ. Friends, it is our responsibility to monitor our spiritual diet! There are all sorts of teachings out there that are contrary to the truth of Christ Jesus! Paul told Timothy in 2 Timothy 4: 3, 4 that there would come a time when people would not endure sound doctrine, but they would jump from one teacher to another, turning away from the truth to embrace fables. 2 Timothy 4:3,4 NKJV For the time will come when they will not endure sound doctrine, but according to their own desires, because they have itching ears, they will heap up for themselves teachers; and they will turn their ears away from the truth, and be turned aside to fables. As the Day of the Lord’s return draws closer we will see more and more the fulfillment of this scripture. It is our responsibility to guard our hearts from false doctrine and teachers that draw people away from the truth. The only way to identify a counterfeit is to know the real. A bank teller identifies a counterfeit bill by handling the real bill over and over every day. It is then that she is able to see and feel the difference in the counterfeit. The more time you spend in the Word of God and communing with the Lord Jesus through the Holy Spirit, the more you will be able to identify false doctrine when it appears to you. When something doesn’t appear to be just right you will have an uneasiness within that is the lack of peace that comes from the discernment of the Lord telling you to watch out for that teaching. In Christ Jesus is the fullness of Deity; He is the exact representation of the Father. You can look at Jesus and His walk through humanity and see the will of God for mankind. Jesus, as He walked upon this earth as a human being, was a living illustration of God the Father. God spoke to us through His life, crucifixion and resurrection. When you see Jesus doing something as He walked on earth you can know that you are seeing the WILL of the Father in action. Jesus did nothing under His own power. He did what He did as an instrument in the Hand of God. Colossians 2:9,10 For in Him dwells all the fullness of the Godhead bodily; and you are complete in Him, who is the head of all principality and power. In Christ Jesus dwells the fullness of God! Fullness – Greek word pleroma means: full number, full complement, full measure, copiousness, plenitude, that which has been completed. And you are complete in Him! Complete – Greek word pleroo – means: to be made full. Jesus, in His humanity, was made full of God and we are made full of God in Him. It is His will for us that we come to full spiritual stature in Him, with Him being the Head and us being His body. Ephesians 4:13-16 till we all come to the unity of the faith and of the knowledge of the Son of God, to a perfect man, to the measure of the stature of the fullness of Christ; that we should no longer be children, tossed to and fro and carried about with every wind of doctrine, by the trickery of men, in the cunning craftiness of deceitful plotting, but, speaking the truth in love, may grow up in all things into Him who is the head—Christ–from whom the whole body, joined and knit together by what every joint supplies, according to the effective working by which every part does its share, causes growth of the body for the edifying of itself in love. The fullness of God in Christ Jesus is within us, but it is through our yielding to His working within us and our interaction with others in the body of Christ that we grow up into the fullness of His stature. We are shaped by what He is doing within us and what we are doing as a part of the body of Christ, interacting with each other. Each of us, according to our giftings, has a share to give to the body of Christ. That causes us to grow up into maturity to the full stature of Christ Jesus. The truth is that we are made full in Christ Jesus, but the manifestation of it happens as we grow through sharing with one another. Each person is a vital part of the body of Christ! We all have a part to play. Are you doing your part in the body of Christ? Hebrews 10:24-25 NKJV And let us consider one another in order to stir up love and good works, not forsaking the assembling of ourselves together, as is the manner of some, but exhorting one another, and so much the more as you see the Day approaching. Just as we will see people straying from the truth in the last days, so we are instructed to stir each other up and encourage one another to good works even more as we see the Day approaching. Our part is to gather together to encourage one another and exhort each other to continue living in love and good works. We are filled with the fullness of God in Christ Jesus to pour it out on each other so we will all grow up to the fullness of His stature. We are to be made mature in Christ Jesus; conformed to the image of Jesus as we yield to Him and interact with each other. My brother and sister in Christ, you are important to me! You are a valuable gift in the body of Christ. Don’t ever say that you are of no value or have no real impact on someone else. 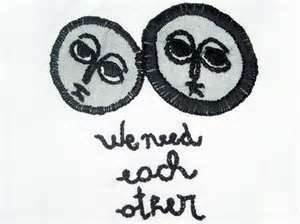 We need each other! Father, I thank You for who we are in Christ Jesus. I thank You for making us the fullness of God in Him. We are Your body, Lord Jesus and You are our Head. Thank You for leading us and guiding us in the way that we should go. May we ever wait to move until we hear our directions from You. Father, I pray for my brothers and sisters in Christ Jesus today, that You would show them how important they are to each other. I pray that they will come to the full understanding that they are complete in Christ Jesus and have the potential for all the fullness of the God-head within them. Father, help us to believe Your word and step out in faith to act on what You tell us to do, that we might have an impact on people for Your kingdom and their eternity. Thank You, Father, for equipping us just as You anointed Jesus, with the Holy Spirit and with power to go about doing good and healing all who were oppressed of the devil. Thank You for making us Your representatives in the earth today! In Jesus’ name I pray. Amen. by aviesplace2012 in Christian Devotionals, Christianity, Faith, Religion, Spiritual Warfare, Uncategorized Tags: A believer in Christ Jesus is empowered by the Holy Spirit., Are you afraid to share your faith?, Can a believer today do the same things that Jesus did?, Christ Jesus, Do you boldly tell others about Jesus?, God, HolySpirit, Jesus is the vine; the believer is the branch. Jesus addresses His disciples in this verse in terms that they could understand. The vine and the branch was illustrated through the vineyards of Israel. No plant bears fruit in and of itself. The branch must get the nourishment that it needs to be fruitful from the vine. 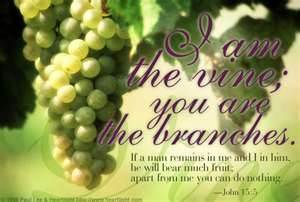 For the branch to continue to bear fruit it must abide in the vine; it must stay connected to the vine so that the nutrients flow from the vine to the branch. The same is true of the fruitfulness of a believer in Christ Jesus. Jesus is said in verse one to be the “true vine” and the Father is the vinedresser. The believer is the branch. For every believer to bear fruit he must be vitally connected to the “true vine”, Jesus Christ. A believer cannot give away something that he doesn’t own himself; meaning that unless a person stays in vital union with Jesus Christ, through prayer and communion in the Word of God, he can’t be filled with the nutrients of Christ’s power and anointing to be able to share it with someone else. Apart from Jesus Christ, a believer cannot accomplish anything of lasting value. It must come from the Vine and flow through the branch to be effective in changing something in another person’s life. When Jesus sent His disciples out to minister to the people He sent them out by two’s and he said to them: “And as you go, preach, saying, ‘The kingdom of heaven is at hand.’ “Heal the sick, cleanse the lepers, raise the dead, cast out demons. Freely you have received, freely give.” (Matthew 10:7,8) Jesus instructed them to give away what they had received from Him. He had given them the anointing to heal the sick, cleanse the lepers, raise the dead and cast out the demons. They had spent time with Him and now they were told to go give it away; to go out and apply what He had taught them. The same is true of every disciple of Christ Jesus; we are all told to go and do the same things that He did. 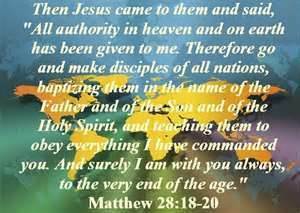 Jesus instructed us to go and make disciples of all nations. He said that there would be some tell-tale signs that people would be able to see in His disciples. Now, it is only our responsibility to do as He commanded; preach the gospel, cast out demons, speak with new tongues, confront demonic powers, and lay hands on the sick so they can recover. How can we do these things? We do them as He works with us confirming His word spoken through us with the accompanying signs. Mark 16:20 And they went out and preached everywhere, the Lord working with them and confirming the word through the accompanying signs.. Amen. As we do our part, God will do His. He is the One that does the work; we are only the utensil that He uses to accomplish His work. Jesus said of Himself that He didn’t do anything He didn’t see the Father doing or say anything that He didn’t hear from the Father. John 5:19 AMP So Jesus answered them by saying, I assure you, most solemnly I tell you, the Son is able to do nothing of Himself (of His own accord); but He is able to do only what He sees the Father doing, for whatever the father does is what the Son does in the same way [in His turn]. So, what is the secret to accomplishing the works of God in our lives today? Well, I think the key is found in the same way that Jesus accomplished His work. We see in so many scriptures that Jesus often withdrew to pray. He spent quality time with His Father. He was empowered by the Holy Spirit to do the works of God through His prayer time. At one point He withdrew to pray and stayed there all night. It was after that special time of prayer that He learned from the Father who He was to choose to be His twelve disciples. Luke 6:17-19 NKJV And He came down with them and stood on a level place with a crowd of His disciples and a great multitude of people from all Judea and Jerusalem, and from the seacoast of Tyre and Sidon, who came to hear Him and be healed of their diseases, as well as those who were tormented with unclean spirits. And they were healed. And the whole multitude sought to touch Him, for power went out from Him and healed them all. The power of God went out from Him and healed them all. The power of God was received from His Father during those times of prayer. Just as a vehicle cannot run on empty, so the believer in Christ Jesus cannot effectively minister without the re-fueling that comes through prayer and Bible Study. It is recorded in Acts 10:38 “how God anointed Jesus of Nazareth with the Holy Spirit and with power, who went about doing good and healing all who were oppressed by the devil, for God was with Him. God was with Him; He anointed Him with the Holy Spirit and with power during those times that He spent in prayer. Jesus, in His humanity, was empowered through His relationship with the Father. He was anointed, set apart and consecrated with the oil or power of the Holy Spirit, to do the work of ministry. The same is true of us as we spend time with the Lord through prayer and the Word that He will anoint us to do the work of ministry. Jesus spoke that of His disciples and those who would follow after Him; believers in Christ Jesus! Do you have trouble sharing your faith with others? Are you bold in your witness of what God has done in your life? Can you freely give away what God has done in you? Are the signs of a believer evident in your life? If you answered “yes” to the first question, “no”, or “not enough” to any of the others, then I would encourage you to spend more time with the Lord getting filled to overflowing so He can do His works through you. God longs to have His children spend time in His presence so He can empower them to do the works of ministry. He wants a body that will follow His directions as the Head to do what He tells them to effectively minister to the world. Will you set aside time to spend with the Lord so you can be an effective witness of His? The key is in receiving from Him so you can pass it on to someone else. You can’t give away something that is not yours! Father, I thank You for equipping me for the work of ministry. I know that it is in knowing You that I am empowered to release what You have placed within me to those around me. Father, I lift up to You those who may be longing to be an effective witness for You. I ask You to draw them by Your Spirit into a deeper, more satisfying communion with You where Your anointing can flow freely to them and through them to impact people’s lives for eternity for Your Kingdom! Father, I thank You for the anointing of Your Spirit that is upon their lives. I ask You to give them the boldness to step out in faith and be Your hands and feet and Your mouthpiece. Thank You, Father, for the fruit that will be evident through their lives. In Jesus’ name I pray. Amen. I am so thankful this morning that I belong to the Lord Jesus! I am His and He is mine. God has so blessed me with such a great salvation. I have a covenant with God that is secured by the blood of Jesus. Usually with a covenant both parties must keep their part of the covenant or it is null and void. But in this case our covenant with God is between Him and His Son so I don’t have to worry about keeping a part of it. I have a right to the covenant benefits because I am in Christ Jesus. When I invited Him into my heart to be my personal Lord and Savior I became a beneficiary of His covenant benefits. That means I have forgiveness of sin, protection from my enemies, healing for my body, provision for my needs, peace when I am in the midst of a storm and whatever else that I need to live a prosperous and successful life. Jesus paid for it all! You will be blessed in your towns and in the country. You will be blessed with many children and productive fields. You will be blessed with fertile herds and flocks. You will be blessed with baskets overflowing with fruit, and with kneading bowls filled with bread. You will be blessed wherever you go, both in coming and in going. “The LORD will bless everything you do and will fill your storehouses with grain. The LORD your God will bless you in the land He is giving you. “If you obey the commands of the LORD your God and walk in His ways, the LORD will establish you as His holy people as He solemnly promised to do. Then all the nations of the world will see that you are a people claimed by the LORD, and they will stand in awe of you. The reason that I am so blessed is so that I can be a blessing to those around me! God spoke that promise to Abram speaking of him being the Father of faith and, by so, making His people children of faith. I am a Son of Abraham by faith in Christ Jesus and so I fall under the blessing of Abraham and the children of God. Galatians 3:7-9 Therefore know that only those who are of faith are sons of Abraham. And the Scripture, foreseeing that God would justify the Gentiles by faith, preached the gospel to Abraham beforehand, saying, “In you all the nations shall be blessed.” So then those who are of faith are blessed with believing Abraham. With all that said, I can say this morning that I am thankful that I am so blessed! Father, I thank You for making me Your child. I thank You for giving Jesus Christ that I might be redeemed and reconciled to You. You are my God and I am the sheep of Your pasture. Thank You for providing for my every need. And thank You for blessing me with all the blessings of life. You have been so good to me! And I praise You this morning and thank You from the bottom of my heart. I am blessed to be a blessing. May all who come in contact with me know that You are the reason that I am blessed. May Your blessing flow through me to touch others for Jesus Christ and the Kingdom of God. May I bless others with the blessings that You have bestowed on me. May my hands be open to release the goodness that You have given me so that others may receive blessings from my God through me. With a grateful heart I offer up thanksgiving unto You this morning for You have been so good to me! In Jesus’ name I pray. Amen. by aviesplace2012 in Christian Devotionals, Christianity, Faith, Religion, Spiritual Warfare, Uncategorized Tags: but so is Hell., God, God didn't create hell for people., God made a way for you to live for eternity with Him., Heaven is real, Heaven or hell; it's your choice., HolySpirit, Is heaven your eternal destination?, Jesus Christ, Jesus died for you., You don't have to live in fear of tomorrow. God alone is God. There is no god besides Him. He is the LORD! When we see the word LORD spelled out in capital letters in the Bible it means that He is Jehovah, the Being who is absolutely self-existent, the One who in Himself possesses essential life, permanent existence. He is the self-existent One, the “I AM WHO I AM”, always the same, yesterday, today and forever. All life is contained in Him. This is God’s name forever! He is the One who always is; always in the eternal now. The same yesterday, today and forever. Hebrews 13:8, 9 NLT Jesus Christ is the same yesterday, today, and forever. So do not be attracted by strange, new ideas…. The good news is that He, God the LORD, the self-existent One who is always the same has chosen you to know Him, to believe in Him and to understand that He alone is God. There is and always has been other gods around that people try to convince others that they are god. 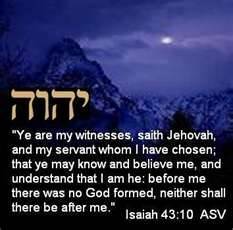 But the One True God is Jehovah, the self-existent One! He is the only One that can save, heal, deliver and set people free. He has done it from the beginning of time and will continue to do it throughout all eternity! There is none above Him or beside Him. And He is calling you into a living and vital relationship with Him. He is alive, He is a person and He wants you to know Him! Only the LORD, Jehovah, has the power to blot out your sins! Jesus paid the price for them, that you might be forgiven. I had a dream last night. It was so vivid and real that I was awakened by it. I dreamed that my husband and I were driving down the highway and we both were transported to heaven. When we got there we began to take stock of friends and family that were there. We quickly realized that not all of our loved ones were in heaven. How sad it was when we began to name them off and some were not there. They had not believed in Jesus and so were not included in the catching away of the church. It was very disturbing to me because I do not want anyone to cross over into eternity without Him. I don’t want them to spend eternity separated from the LORD. Heaven is a glorious place where we will forever spend time worshiping our Creator, ruling and reigning with Christ Jesus and eternally safe at home with Him. I awakened this morning with this song running through my head. How glorious it will be when I see Jesus! But for those who do not choose Jesus as Lord and Savior it will not be a glorious eternity. It will be an eternity spent separated from God, who is Light and Love; spent in outer darkness where there will be weeping and gnashing of teeth. Jesus called the place Hades, Gehenna or Hell. He tells the story of Lazarus and the rich man in Luke 16:19-23 and says that the rich man was in torments in Hades. Heaven is real, but so is Hell. God didn’t create hell for people; He created it for the devil and his demons. But each one of us, through our own choices, will spend eternity in one place or the other. God has given each of us a free will to choose either to know Him and live for eternity with Him, or reject Him, live for ourselves and spend eternity apart from Him. He sent Jesus to pay the price for our sin so we could know Him and live throughout eternity with Him. You must be born again! John 3:16-18 “For God so loved the world that He gave His only Son, so that everyone who believes in Him will not perish but have eternal life. God did not send His Son into the world to condemn it, but to save it.” “There is no judgment awaiting those who trust Him. But those who do not trust Him have already been judged for not believing in the only Son of God. God doesn’t want anyone to perish and spend eternity apart from Him. In fact, He is delaying His return so that as many as possible can come to the saving knowledge of Jesus. 2 Peter 3:9 NLT The Lord isn’t really being slow about His promise to return, as some people think. No, He is being patient for your sake. He does not want anyone to perish, so He is giving more time for everyone to repent. You might say that I have been spending a lot of my blogging on this subject lately. And that is true. But the reason is that I see the shortness of the time and am more aware of the need to make sure that I do everything that I can to warn people of their need to receive Jesus as Savior and Lord. So, for those of you who have received Christ Jesus please be patient with those who haven’t. This blog is intended to reach both the lost and the saved. For some it’s a glorious time of celebration as we look forward to Heaven and being able to see our Savior and Lord. For others, it’s a time where eternity is held in the balance. The scales could tip either way for them. And I want to be sure that I give them ample opportunity to receive Jesus Christ as Savior and Lord. Father, I bring those before You who do not know You this morning. I pray that today will be their day of salvation; that they will put off no longer their decision to receive Jesus as Savior and Lord. I ask You, Holy Spirit, to convict their hearts of their need for Jesus. Father, I pray that Jesus will be lifted up and all eyes will see that He is the One that You sent to pay the price for their sins. You said, Lord Jesus, that if You were lifted up that You would draw all men unto Yourself. I lift You up this morning and proclaim that You are Lord; You are the Savior of the world; the One and only way to heaven. Father, I pray that Your Spirit would bring the lost to salvation today. In Jesus’ name I pray. Now, if you have never asked Jesus into your heart to be your personal Savior and Lord and you would like to, please pray this prayer with me and mean it sincerely in your heart. Father, I come before you confessing that I am a sinner, lost and in need of the Savior, Jesus Christ. I have sinned against You both by birth and through the choices I’ve made to live my life for myself. I realize that I am lost and can do nothing to save myself. I ask You to forgive me for my sin, to cleanse me and to come and live in my heart. I believe that Jesus died for me and that You raised Him from the dead to new life and that if I confess Him as Lord and Savior that I will be saved. So I do that today; I confess Jesus as my Savior and Lord and I thank You for saving me. I will live from this day forward for You. In Jesus’ name. Amen. Now Father, I bring those before You who are lonely and in despair, struggling through life. You said in Your word that You have chosen them to know You, to believe in You and to understand that You alone are God. You are all powerful, all knowing and all present. There is nothing that escapes You and You are the God who rules over all. No one can stop You or reverse what You do. Father, I ask that You would work a miracle in their lives today. That they would truly know that the God of all creation is changing their situations and bringing an end to the storm that has been raging in their lives. We give You glory for what You are doing in each of our lives. Thank You, Father, for hearing and answering my prayer. In Jesus’ name I pray. Amen. It’s not often that I wake up with a secular song running through my mind, but this morning I kept hearing the song, “Bridge Over Troubled Waters” speaking to my spirit. As I listened to this song I realized that Jesus is the bridge over troubled waters for us. He is the one who gives us safe crossing over the troubles that arise in our lives. God provided a safe haven for us that protects us from the storms of life when we enter into a relationship with His Son, Jesus Christ. We are no longer servants of God, but through Jesus we have become His friends. He comforts and shelters us from the troubling times that rage around us. He is our bridge over troubled waters. It’s through communion with His Spirit who lives within us that we find comfort in times of trouble, a friend who’s always there, leadership and guidance when we have lost our way and one who sticks close to us through all kinds of life’s challenges. The song speaks of someone being there to lay down his life to be that bridge over troubled waters for his friend. Jesus laid down His life that He might be that bridge to God for His friends. Jesus willingly went to the cross for us that He might bridge the gap that was between us and the Heavenly Father because of our sin. He is the way that leads to reconciliation with God that no man could make. It took the sinless blood of Jesus to make the bridge that would lead us over the gulf of sin into the presence of God. He has reconciled sinful man with a holy God! Ephesians 2:14-18 For He Himself is our peace, who has made both one, and has broken down the middle wall of separation, having abolished in His flesh the enmity, that is, the law of commandments contained in ordinances, so as to create in Himself one new man from the two, thus making peace, and that He might reconcile them, bot to God in one body through the cross, thereby putting to death the enmity. And He came and preached peace to you who were afar off and to those who were near. For through Him we both have access by one Spirit to the Father. Have you traveled the cross that bridges the gap between you and the Father? Jesus is the only way to get there. There is no other way to get to the Father except the way of the cross. You must come through the blood of Jesus, accepting what He did for you, personally, through Him laying down His life for your sins. Sin kept us from being able to come into the presence of a holy God, but the blood of the sinless Son of God restored us to right relationship with Him. Jesus took our sin upon Himself and nailed it to the cross, making us dead to sin and alive to Him when we we receive His payment for our sin. Salvation comes to us as we realize that we are born as sinners and we can’t do anything for ourselves to save us from our sins. Then we come to an understanding that Christ died for us that we might not have to spend eternity separated from God because of our sin. He laid down His life and became that bridge over troubled waters for us. We receive salvation through faith in Him as a personal relationship, not a legalistic, ritualistic approach to God, but as one who knows Jesus and accepts His personal payment for our sin. Have you believed in your heart that Jesus died for you and God raised Him to new life again? Have you confessed Him as your Lord and Savior? 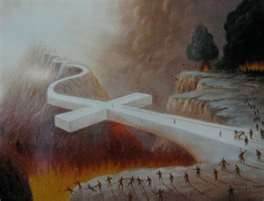 That’s how you cross over the bridge into God’s presence. Those who haven’t crossed the bridge will spend eternity separated from the Father. But those who by faith receive what Jesus did for them on the cross and confess Him as their personal Savior and Lord have free access to the bridge that leads them across the troubled waters of life. They are free to cross over into God’s presence. If you have never received that salvation that we have talked about this morning. It’s really very simple; people often feel that they have to perform to a certain standard to receive salvation. But as the above scripture says all you have to do is believe and receive! If you have never done that and you want to, please pray with me and mean it sincerely in your heart. Father, I come before you now confessing that I am a sinner, both by birth and by choice. I have chosen to walk through life in my own way, that is apart from You. But I now realize that Jesus paid the price for my sin; that He died on that cross for me and that You raised Him from the dead; and that if I confess Him as my Lord I can receive access to that bridge that brings me into Your presence. I believe in my heart that Jesus is the only way to be reconciled to You, Father God. I believe that He died for me, that You raised Him back to new life and I confess Him now as my Savior and Lord. I thank You, Lord Jesus, for laying down Your life for me and for saving me. Thank You, Father, for making me Your child. From this day forward I will live for you! In Jesus’ name I pray. Amen. If you prayed that prayer and received Jesus into your heart you now have access to the Father, through the Son. He is your Savior and Lord and your name is recorded in heaven as being in the family of God. Congratulations! That is the most important decision a person can make and has to be made this side of death. We only have the freedom to choose while we are still alive. It is important that everyone understands that there is no choosing once you die. The choice has to be made now! Father, I thank You for those who have chosen Jesus this morning. I pray for those who may be wavering in their decision to follow You. I pray that they will choose now, before it is too late, to be born into the family of God. Father, I also lift up those who are experiencing troubled waters in their lives. I pray that You will make Yourself real to them and show them that You are the bridge over the difficulties that we experience in life. We can walk above the raging storms of life, safe in You. Thank You for giving us free access to Your salvation! In Jesus’ name I pray. Amen.